At the Terra Foundation, we believe that art has the potential both to distinguish cultures and unite them. We demonstrate this conviction by sharing our collection of American art with institutions around the globe for a variety of projects and initiatives. To discover how each work of art included in this year’s holiday card activates our mission, please click on the links below. To view our entire collection online, please click here. 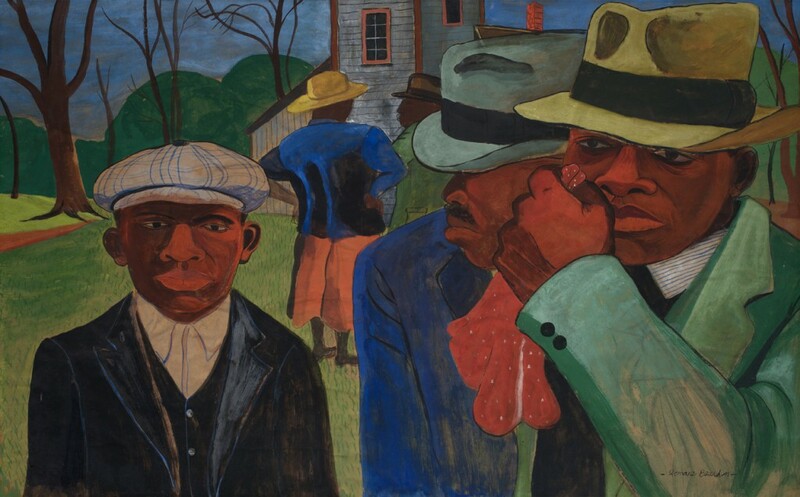 Stylistically distinct from Romare Bearden’s collage work, After Church provides a bridge from the artist’s early social realist imagery to his later engagement with abstraction and collage. Combining sketched lines, abstracted figures, and the application of color in large swathes, After Church moves away from strictly representational imagery toward a transitional hybrid of figurative and abstract painting. After Church represents a pivotal moment in the artist’s career, grounding his practice in the African American experience even as it highlights the creative tension between representational imagery and abstraction that Bearden would continue to exploit throughout his career. Although our focus is the historical art of the United States, we activate works in the collection by lending them to exhibitions that resonate with contemporary issues. Bearden’s After Church, for example, was included in the recent exhibition One-Way Ticket: Jacob Lawrence’s Migration Series and Other Visions of the Great Movement North at the Museum of Modern Art, where it provided depth and richness to diverse narratives about race and the Great Migration. 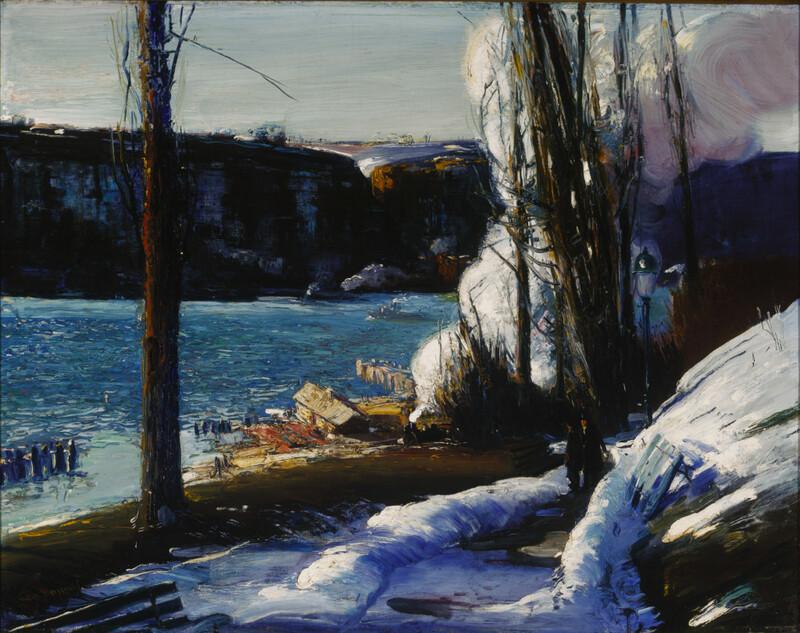 George Bellows shared his interest in wintertime and snowy scenes with many contemporary American artists, including members of the Ashcan school, so called by a derisive critic for their gritty urban realism and anti-academic technique. While loosely associated with the Ashcan artists, Bellows aspired to more assured critical approval. His interpretations of New York City in winter, particularly his emphasis on the park and the river, as depicted in this painting, use cold and snow to soften harsh urban realities. The intimate but honestly observed relationship between women and children had long been Mary Cassatt’s special theme. In several paintings dating to the early 1890s the artist placed her typical figures in boats. Summertime is directly related to an identically titled canvas (about 1894; Armand Hammer Museum of Art, Los Angeles), which features the same woman and girl seen from a greater distance, with more of the rowboat and a bit of the shore visible. Because the surface of that painting reflects a less spontaneous application of paint, scholars have suggested that the Terra painting was executed first. 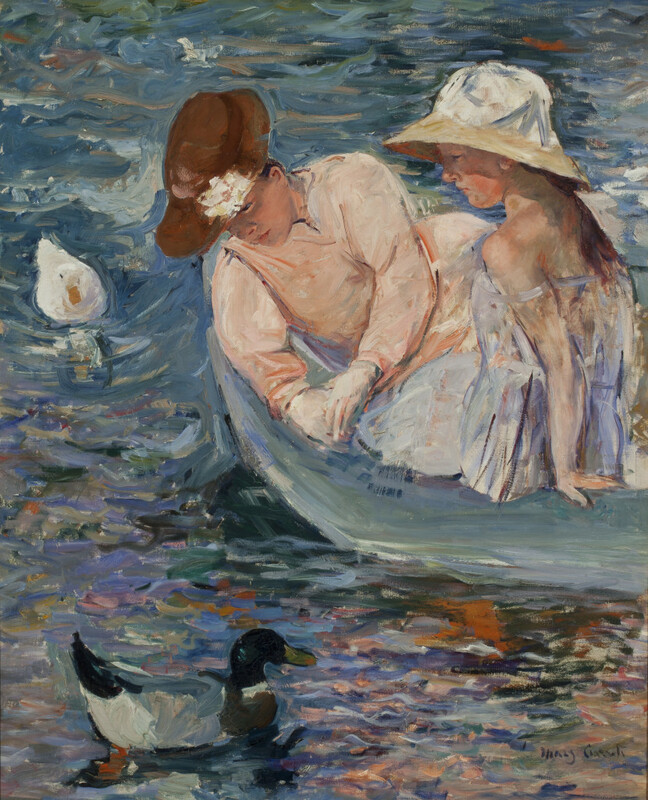 Regardless of the relationship between the two, this version of Summertime stands as an important example of Cassatt at the height of her artistic powers. The artist is also the subject of the essay “Achille Segard Interviews Mary Cassatt: A Living Master of Impressionism, Her Biographer and the General Audience” by Hadrien Viraben, winner of the 2015 Terra Foundation International Essay Prize, which is an active part of the foundation’s growing publications program. Charles Demuth’s Rue du singe qui pêche (translated as the “Street of the Monkey Who Fishes”) is a partially abstracted image of a deserted imaginary street in Paris. Demuth was one of the first artists to incorporate into his works text derived from urban signs and advertising. Rue du singe qui pêche is the only painting in which he simulated actual commercial signage, yet many of the fragments of presumably French words are unintelligible. This past summer, we relocated our Paris Center & Library to the historic hôtel Lévis-Mirepoix, at 121 rue de Lille. Housing larger and improved event and library facilities and a collaborative exhibition space with the Fondation Custodia, the center will continue to serve as the foundation’s European hub, providing regular programs—lectures, symposia, and artists’ talks—on current topics in American art and visual culture, with an emphasis on cross-cultural and interdisciplinary perspectives. 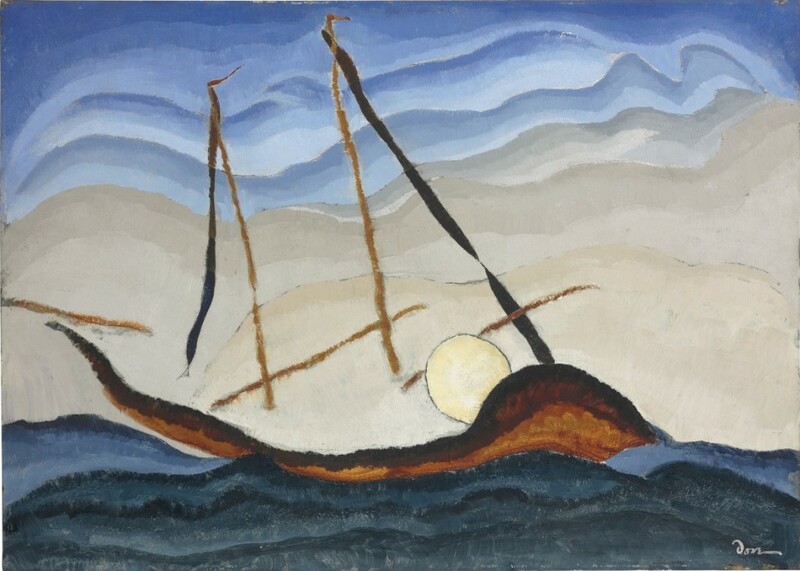 Opposed to what he saw as the growing commercialism and materialism of American culture in the first quarter of the twentieth century, Arthur Dove maintained an emotional and spiritual relationship with nature expressed through the tangible record of his work. Boat Going Through Inlet is painted on tin, and across its surface scored lines cut through the layers of paint to reveal the metal beneath. This incised technique creates a shimmering effect that recalls nothing more than the ghostly sheen of moonlight reflecting off waves and mist, conveying through medium and color Dove’s emotional response to the natural world. Boat Going Through Inlet is among five newly acquired paintings that help extend our mission of fostering the exploration, understanding, and enjoyment of the visual arts of the United States for audiences across the globe. 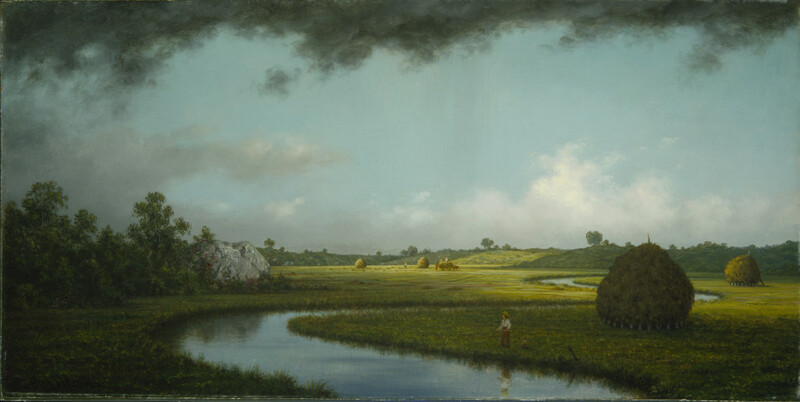 Marshlands were a virtually untried pictorial subject when Martin Johnson Heade began painting them. Flat, open, and offering few features to relieve their seeming monotony, they deviated unforgivably from the conventions of picturesque landscape art. By the mid-1860s, however, Heade was among many American landscape artists who had come to appreciate the level, quiet places where land and water meet and mingle under open skies. They used such settings as vehicles not only for exploring subtle light and atmospheric effects but also for meditations on time’s passage, the fleeting beauty of nature, and the redemptive value of rural life. Newburyport Marshes: Approaching Storm is featured in the exhibition Picturing the Americas: Landscape Painting from Tierra del Fuego to the Arctic, co-organized by the Art Gallery of Ontario, Pinacoteca de São Paulo, and Terra Foundation. Currently on view at the Crystal Bridges Museum of American Art, in Bentonville, Arkansas (through January 18), Picturing the Americas is the first-ever exploration of landscape painting from a truly pan-American perspective, bringing together more than 100 works of art from private collections and museums in Brazil, Canada, the Caribbean, Ecuador, Mexico, Uruguay, and the United States. From the beginning of her career in the late 1910s, O’Keeffe had been drawn to the floral still life. 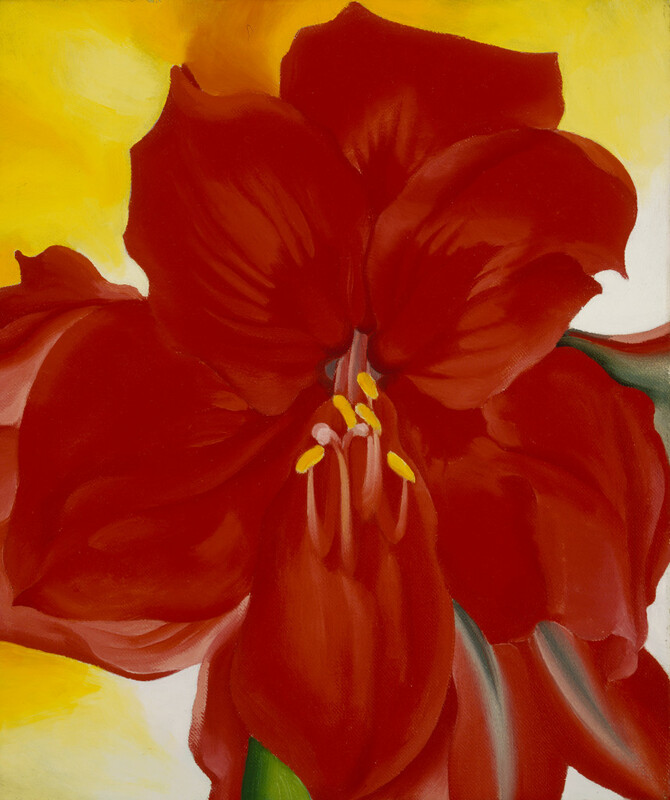 Treasured for their fragile beauty, flowers had long been thought the proper subject for female artistry; indeed, O’Keeffe may have been inspired to become an artist by her grandmothers, both amateur flower painters. In her early works, painted at the beginning of her relationship with gallery owner Alfred Stieglitz (1864–1946), whom she married in 1924, O’Keeffe used flowers as vehicles for abstraction, creating compositions that evoke rather than represent their ruffled petal edges and inner recesses as the entrance to a secret world of nature. Red Amaryllis was loaned to the exhibition Georgia O’Keeffe et ses Amis Photographes, at the Musée de Grenoble, France, which was the subject of an academic program event—a dialogue by the same name—organized by and hosted at the new Paris Center & Library.